I have made the journey to Bexleyheath before but this Friday I had a very special reason. 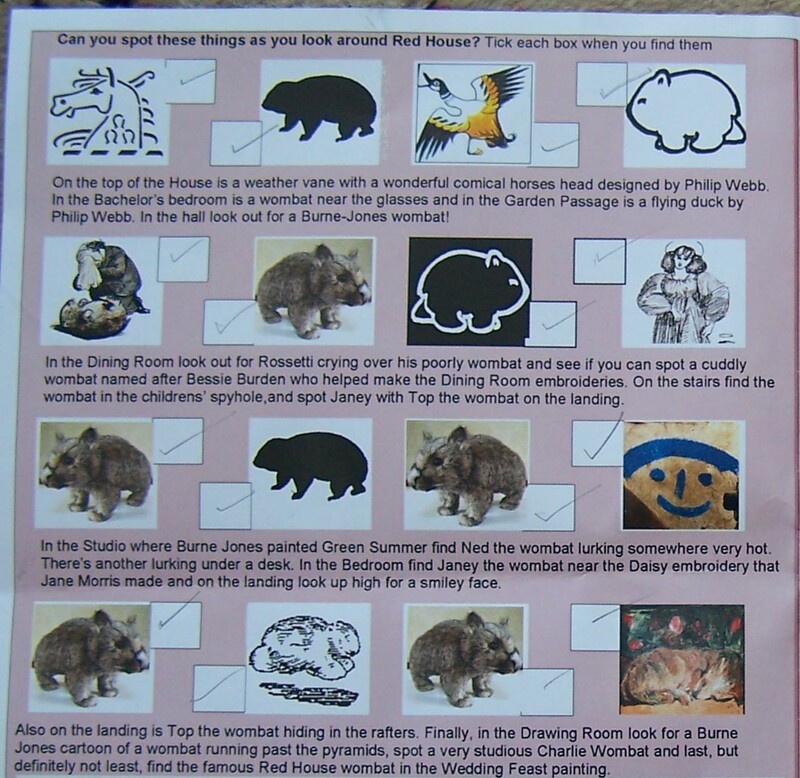 It was the first Wombat Friday that the Red House had with their Wombat Trail. God bless you Red House! 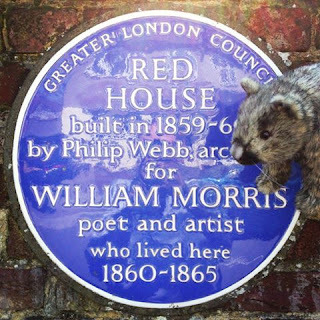 Yes, all this summer holiday, the good folk of the Red House are hosting a bevy of wombats and their own special brand of madness. How could we resist? The inside contains jolly wombat larks! Lily-Rose and Fanny the Wombat seized the sheet and away we went. Miss Walker is used to visiting various historic houses and museums but this gave her purpose as Miss Holman (lady adventurix and resting ninja) and I were dragged from room to room with squeals of delight at the discoveries. We had an absolute ball. While Lily searched for wombats Miss Holman and I looked at the work that has been done (and continues to be done) around the building. It's been 10 years since the Trust acquired the house and the work they have done even in the last few years since we last visited is amazing. Look at what is under the chair at the wedding feast...could that possibly be a wombat? While in form it reminds me of the dog in Isabella by Millais (and the little dog in La Belle Iseult by Morris, as the room guide reminded me) the face has a definitely wombattish look, with those familiar little triangular ears. Painted during the blissful early 1860s, this mural by Burne-Jones definitely reminds us that for a moment the Pre-Raphaelites lived in a sort of paradise. The motto in the newly revealed lower section of flowers and coloured band reads 'qui bien aime tard oublie' which translates as 'He who loves best forgets last'. After all the dashing around there was no chance I was leaving without Miss Walker visiting the gift shop and by the time I reached her (I had paused to talk to the lovely James Breslin, House and Garden Manager, about wombats, obviously) she and a wombat, appropriately named 'Top', had made friends and was coming home with us. To be fair I added to the bill with one of their gorgeous pewter 'Si Je Puis' badges and an apple tree. Everyone left happy. On a personal note I'd like to thank every single member of staff and volunteers we met yesterday. As most of you who follow this blog will know, Lily-Rose is severely visually impaired because of Albinism. 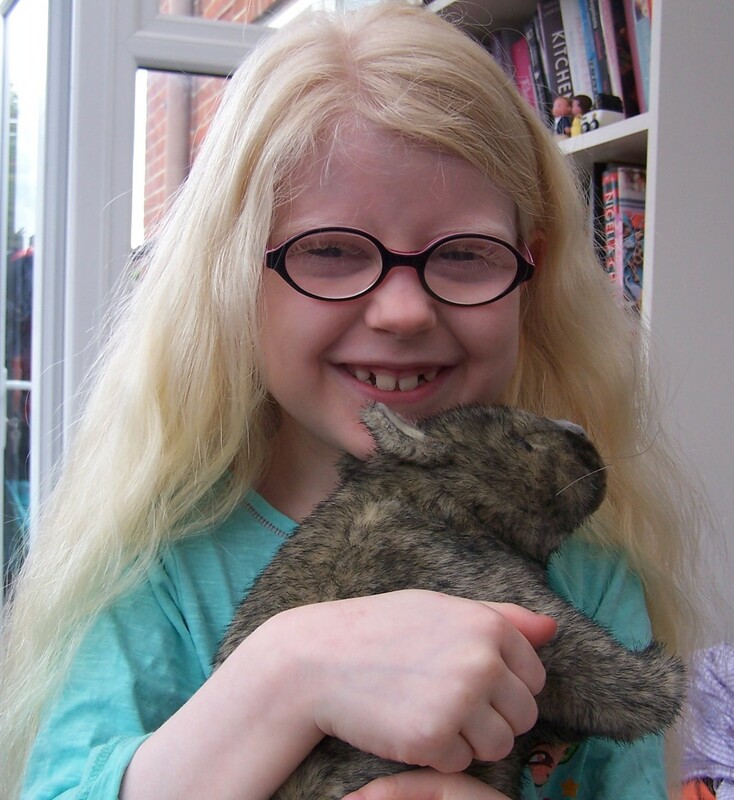 This means that not only is her eyesight on the 'dodgy' end of the scale but she has added excitement with nystagmus (rapid uncontrolled eye movement) which means what sight she has can be disrupted into virtual blindness at any time especially when she feels under pressure or uncertain of her surroundings. Every room guide we met made every effort to engage with her in her hunt for wombats and helped her find them. |She loved every minute. The Red House are running the trails every single day of the holidays, not just Fridays, and if you have kids and can get there, I can't recommend it enough! 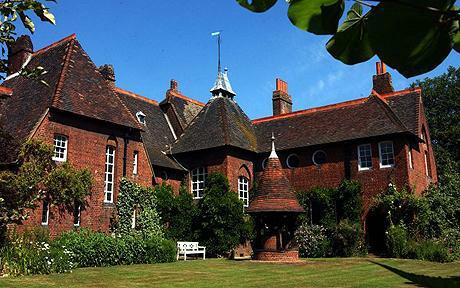 Visitor information for the Red House can be found here. Oh Lily you have a Top wombat just like mine - how cool is that and Red House! My wombat (still, as yet, unnamed) is obviously related to Lily's too. A huge round of applause to the Red House for entering into the spirit of eccentricity so beautifully. If I was anywhere near, I would definitely visit. It looks like you all had a wonderful time. The Red House is the coolest and we salute them. 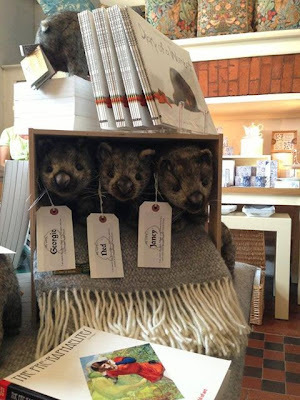 Well done National Trust for embracing the madness, we thank you very much. 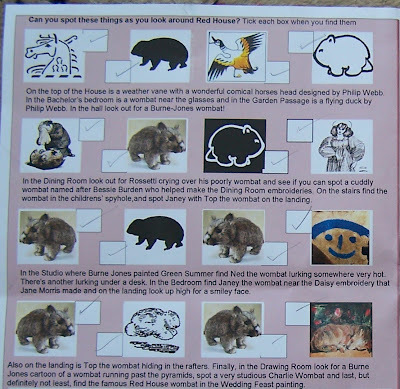 I hope people will go and enjoy themselves, I don't think you need to be a child to take part in the wombat trail! That is one happy and satisfied young lady! I loved reading that they made her visit so special. 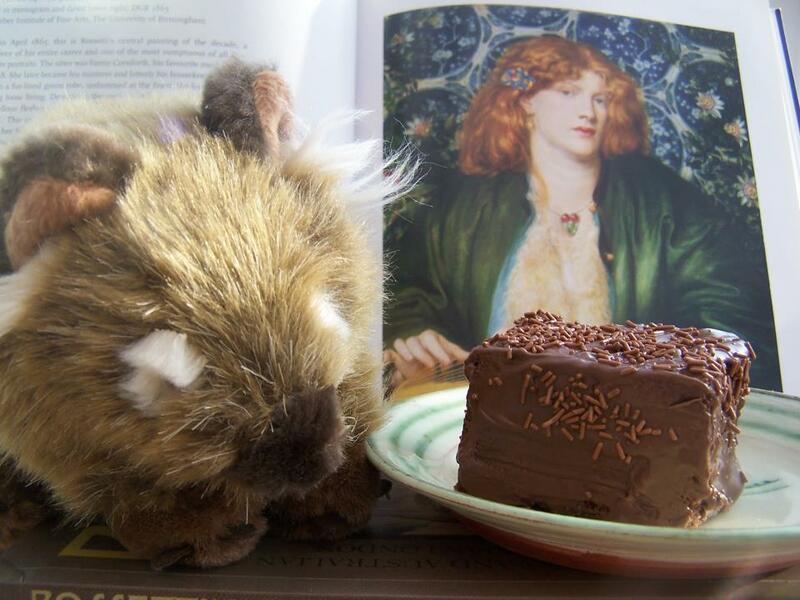 She is a seasoned Pre-Raphaelite visitor now and loves scampering around new places. The wombats made it extra special for her, that's for sure! Happy Birthday Ned, All is Forgiven!